A while ago I wrote about the family cat, as she sadly edged into her dotage. In time, the inevitable happened, albeit with some humane assistance, and a hefty bill, from the vet. It was the right, but difficult thing to do, to spare further pain and discomfort for Treacle, whose quality of life was very much at the low end of the scale. The next inevitable thing to happen was to bring on a replacement from the substitutes bench, i.e. the local Animal Welfare Centre. So Cat5 arrived, following extensive checks on whether the house and its inhabitants met cat ownership standards. Relevant sums of money exchanged hands: not bribes, I hasten to add, and assorted supplies and instructions were provided, before Cat5 was subsequently collected and introduced to her new home and family. Despite nerves all round, all went well, and the process of settling in, checking out the house, its furnishings and occupants was duly conducted in a reasonably harmonious manner. ….. leaves me wondering whether all of these endearing habits enrich my life, or do they do something else to it. But the bottom line is that I am the tragic victim of feline harassment – there is no escaping the truth: I am relentlessly stalked. 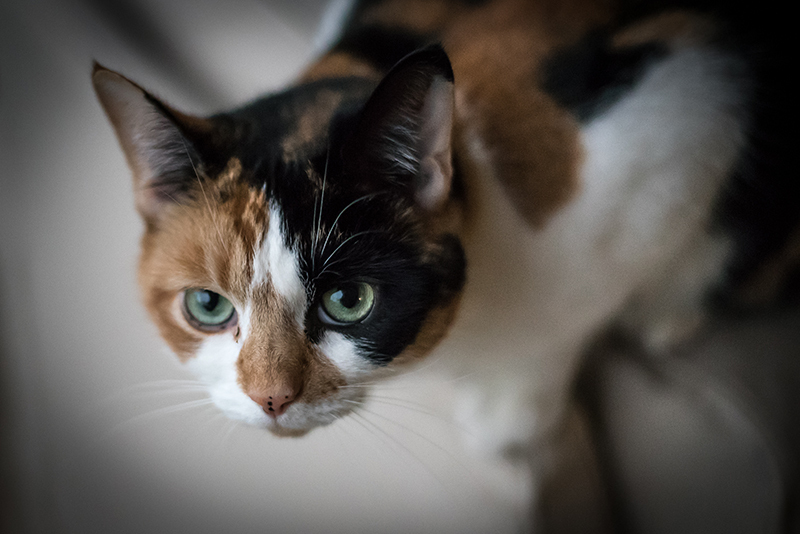 Cat5’s sensors are finely tuned to monitor my every movement and are able to give her advance notice of my intentions, even before I know that I have intentions. She will armchair-bomb me, claws at the ready for a controlled landing, as soon as I am attempt to sit down. Then it’s nag, nag, nag until I give in and get on with the job of rubbing, stroking, tickling her around the ears. A momentary lapse in attention starts the nagging again. And then she dribbles! Is this some sort of freaky dribbling cat? The end result is that I’m not only covered in cat hair, but also in cat dribble. There is a plus side, however, but only just! As Treacle started to run short of her nine lives, she was no longer able to bound through the cat flap when nature called. So the litter tray, and the process of litter tray management took on increasing importance in the household. Fortunately, Cat5 has youth on her side and is able to negotiate the cat flap. This means that litter tray management is no longer a task on the domestic to-do list, but it does leave me wondering what specific location Cat5 has identified as Pooh Corner, whether it is in my garden, and if so, when and how will I discover it. I tread carefully. Excellent John, a mighty guffaw from me with this. I worry about your staggering though!